is owned by: Shuriken X.
Click the logo to join The ring! Your Site has been suspended from the Ring (darkstalker, Darkstalkers Web Ring) until the navigation code is working properly. You should login to manage your Site and check the accuracy and placement of your navigation code. You can use the Test link in Site management to have the system check for correct placement. Contact your RingMaster once the navigation code is properly in place, and you have verifid that is PASSes the checker test. 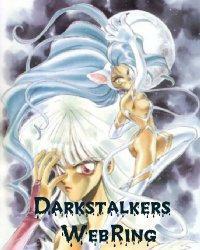 page has been made active in the WebRing Darkstalkers Web Ring.